PLJV is using the landscape design process to develop a new Implementation Plan that will replace the Area Implementation Plans (AIPs) completed in the last round of biological planning. A preview of the new plan, which will be completed in 2018, can be seen below. In the meantime, if you need information about goals and objectives related to waterfowl, shorebirds, waterbirds or landbirds, refer to PLJV’s contribution to the four bird conservation plans or contact Anne Bartuszevige for more specific information. PLJV maintains a six-state landcover layer. With this landcover, we can evaluate and understand the current landscape context including the location of row crop agriculture, large blocks of contiguous grasslands and public lands. 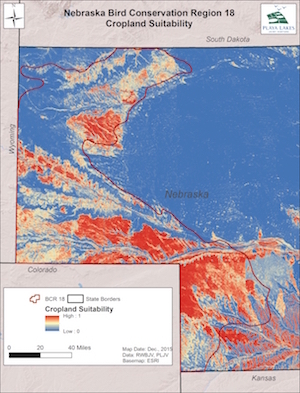 In addition, we use this land cover as a base layer for modeling drivers influencing patterns on our landscape, such as understanding where row crop agriculture has occurred and what characteristics can be used to predict future expansion or contraction (see the Cropland Suitability Model for Nebraska BCR18 on the right). In addition to developing risk surfaces to help project future landscape condition (e.g., crop suitability model), we can use the results of models produced by others to help us project the future condition of the landscape. For example, Burris and Skagen (2013) modeled effects of landcover and projected climate change on sedimentation rates of playas and then projected playa loss due to filling with accumulated sediments out to 2100. In another example, we can use projections of aquifer depletion combined with the crop suitability model to project where transitions from one agricultural production type to another may occur. Using models to attempt to understand how the landscape will change in future informs conversations with partners about conservation strategy. For example, it can help partners decide where a program might be targeted to yield the best conservation results or where new conservation partnerships should be developed. Human dimensions research can also inform these conversations. Understanding the social and cultural dynamics can hone conservation initiatives to be more beneficial to the people in the area, as well as the wildlife. Ultimately, PLJV’s Implementation Plan will be a commitment to action by our partnership to achieve habitat conservation for the birds, other wildlife and people of the western Great Plains.